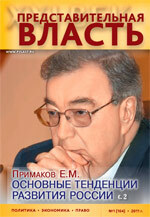 An article by E.M. Primakov on the main tendencies of Russia’s development is the main topic of Issue 1/2011 of the magazine “Representative Power – Century 21”. Interview with Victor Bobrov, historian, philanthropist, member of the Open Science Association "Noosphere" by the seventh "antithesis" Yevgeny Primakov. Other important topics include articles by the following authors: V.I. Melnikov - “Оn Further Development of Organizational and Legal Mechanisms of Regional Security and Implementation of Russian President’s Decree “On Additional Measures to Guarantee Law and Order”; N.M. Korshunov – “Strategy of National Security of Russia and Challenges of the Century”; R.N Salieva, Z.M. Fatkudinov – “Problems of Legal Regulations in the Sphere of Man-Made Fields”; I.L. Trunov, L.K. Iivar – “Violation of the Constitution When Recognizing Guilty in Road Accidents (Accident on Leninsky Prospect); A.M. Oreshenkov – “Norwegian Assault on the North East of Russia (Part 2); Yu.S. Ignatov – “On a Meeting of the Board of Trustees of the Moscow Tchaikovsky’s Conservatory”. Several other articles also deserve mentioning: N.E. Konkin – “Automated Voting in the Philippines: a Challenge of the Times or a Tribute to the Circumstances; M.A. Lipchanskaya – “Political Parties as an Institutional Form of Citizens’ Participation in Federal Law-Making Process”; I.S. Amiantova – “A Big Coalition in West Germany: Historical and Legal Aspects of Its Creation”; D.A. Marusenko – “Peculiarities of Control Activities of the Russian Parliament”. Yuri S. Ignatov, Correspondent of "Representative Power - Century 21." Abstract. In December 2010 a meeting of the Board of Trustees of the Moscow State Conservatory named after P. Tchaikovsky. Were presented greetings and reports of trustees. Noting the active participation of Council members in creative projects Conservatory, to strengthen contacts with various government agencies. Particular attention was paid to reports of a new project of establishing a fund targeted capital (endowment) Conservatory. V.I. Melnikov, Deputy Chairman of the Defense and Security. Key words. regional and public security, legal order, Russian Federation Presindential Edict, model of regional security, organizational legal mechanisms of regional security management. Abstract. The article is concerned with the most actual current problem of supporting public security and order within the territory of constituent territories of Russian Federation according to the Russian Federation Presidential Edict of 11 December 2010 on issues of order support supplementary measures. Korshunov N.M. Will a new strategy of national security of Russia respond to the challenges of the century? Key words. National security, state, civil society, personality. Abstract. The article shows a significance of a strategy of national security of the Russian Federation. Some arguments are proposed for a number of critical considerations as to the contents, structure, legal and dexterous formulation of a document. Some propositions concerning adjustment of shaping mechanism of normative legal basis of national security of Russia are presented. Saliyeva Roza Nailjevna, Institute for problems of ecology and subsoil use of AST, head of the laboratory for problems of legislation regulating relations in the sphere of subsoil use and ecology, professor, doctor of law. Abstract. Existing Russian legislation regulating relations associated with the use of mining and processing waste plants is analyzed. Public relations concerning the utilization and processing of technogenic mineral resources are shown to be regulated fragmentarily and inefficiently, discrepancies are observed between some norms of federal waste and subsurface legislation and the Tax Code, and the terms "technogenic deposits", "echnogenic mineral resources", "technogenic formations" and others are not defined by law. Proposals are made to amend individual articles of the RF Subsurface Law, Federal Law on Production and Consumption Waste and RF Tax Code and to improve legal regulation in the spheres of utilization of technogenic mineral resources and economic-geological evaluation of technogenic deposits. Lyudmila Konstantinovna Aivar, Doctor of Juridical Science, Professor. Abstract. Annually in the world, according to the UN, as a result of road accidents killed more than 1,2 million people, 20 - 50 million are injured. In Russia, on the road are killed from 30 to 40 thousand people, accounting for pedestrians, many of whom are children, accounting for 40% of fatalities in road accidents. Real figures are much higher: the number of fatalities in road accidents will only include those who died within seven days after the accident, if a person died without regaining consciousness at the 10th day, he falls in the number of injured in the accident. Oreshenkov Alexander Mikhailovich, Ministry of Foreign Affairs of the Russian Federation, Consular department, senior counselor, Philosophy degree (international law). Abstract. The treaty between the Kingdom of Norway and the Russian Federation concerning maritime delimitation and cooperation in the Barents Sea and the Arctic Ocean was given by our mass media as a reasonable compromise which was achieved after 40 years of unsuccessful negotiations about delimitation of these spaces. However there was not taken into account in this treaty conditions of another treaty – on Spitsbergen and lawmaking actions of Norway to change unilaterally a regime of spaces in the zone of action of this treaty, which are fixed in its first article (10°/35° e.l. and 74°/81° n.l.). Konkin Nicolay. Automated National Elections in Philippines: Time Challenge or Circumstances Tribute? Nicolay Konkin, Executive Secretary of the Central Election Commission of the Russian Federation. Abstract. During decades the people of the Philippines participated in Elections, which were shaded with manipulations of counting of results and long day stoppage of declaring of final results. In these connections and also to provide a transparence of the whole election process, the Philippine Congress passed a bill on Full Automated National & Regional Elections in 2007. In May of 2010 first fully automated elections were held in Republic Philippine, these automated elections were the first one in South-East Asia. In the material our readers can get acquainted not only with specifics of an Automated Vote, but also find out the competent opinion of Russian experts in a field. Key words. Political parties, lawmaking process, citizen participation in state administration. Abstract. The article is devoted to research of participation forms of political parties in federal lawmaking process. The author considers that political parties are institutional form of citizen participation in state administration in sphere of lawmaking activity. The article contains examples of influence of political parties on federal lawmaking process. Abstract. The article is devoted to the big coalition phenomenon historically-legal analysis based on Federal Republic of Germany example. The method used by author is so-called practical deviation, which gives an explanation of concrete political coalitions creation conditions. Author demonstrated that both big coalitions (1966 – 1969 and 2005 - 2009) creation reason was an impossibility to create classical (Minor) coalitions. Considering the changes in modern political system of the country connected to the growing political role of small parties author supposes that big coalition appearing on a political arena of Germany can become more frequent as a prospect. Keywords: Russian Constitution, parliamentary control, Federal Assembly of Russia, State Duma, Federation Council of Russia, Russian President, parliamentary investigation, federal law. Abstract. This article examines the specifics of parliamentary control conducted by the Federal Assembly and its chambers, and contains an analysis of both the constitutional and the legislative matters of this work, as well as suggestions concerning its further development and improvement, including specific focus on the necessity of adoption of the Federal Law on Parliamentary Control.